We caught the 8:30am train from Truro to London Paddington. 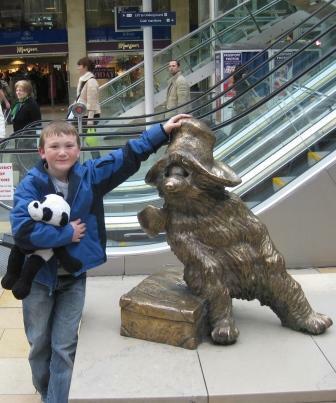 It seemed just wrong to pass through the station a second time without stopping for a photo of BigB, his bear and the statue of the eponymous bear. But, we weren’t all done with trains. We needed to get to St. Pancras for our (thankfully short) train journey to Woburn, which presented us with another photo opportunity – since St. Pancras and King’s Cross stations are literally across the road from each other. Wondering why we’d want to visit three train stations in one day? Because of Harry Potter of course! King’s Cross being, as all true fans of the boy-wizard know, the station where Harry and his school-friends disappeared through the station wall at the magical Platform 9 3/4 to catch the train to Hogwarts. King’s Cross is a busy station and you do need to persevere through the busier platforms at the front of the station to find Platform 9 3/4. There’s also construction work happening at the station so Platform 9 3/4 isn’t currently located between Platforms 9 and 10 at all – but there are plenty of signs to the re-located site and the station staff are also well used to people wondering around, cameras in hand, in this area. 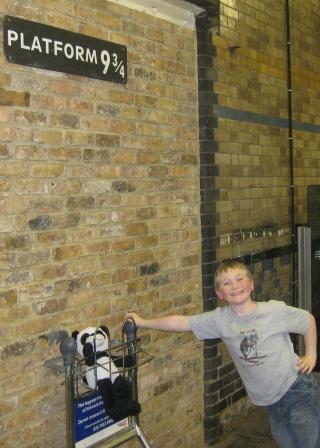 Two trains, three train stations, one very happy kid. Head on over to DeliciousBaby for more Photo Friday fun! 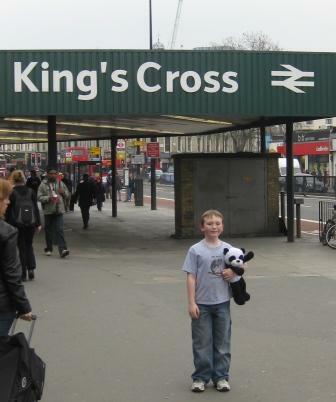 This entry was posted in Britain, International Escapades, Kid Travel Photos and tagged Britain, England, Harry Potter, King's Cross, London, Paddington, St. Pancras, UK on April 2, 2009 by wandermom.